Home Six Flags St. Louis The Holidays Are Showing in Theme Parks Around the Globe. The Holidays Are Showing in Theme Parks Around the Globe. The Holidays Are Here. Theme Parks Winter Celebrations Begin Around The Globe! Tis the season, Christmas in the parks are finally here. A time where lights fill the midways and Santa visits his favorite parks. Seasonal shows and Christmas events scatter the amusement park world during this time, here's a look at our favorites of what's going on where! Universal Studio's Islands of Adventure and Hollywood's Magic of Christmas at Hogwarts. From the singing frog choir to The Magic of Christmas at Hogwarts Castle, there's always something to see or do at Universal during the Holidays. "Using the latest in projection-mapping technology, Hogwarts Castle will completely transform this holiday season. A spell will be cast on the Castle, illuminating it in festive décor, candlelight and moments inspired by the films." Holidays at Universal are filled with fantastic festivities and seasonal shows including the popular "Macy's Holiday Parade," at Universal Orlando. Disney Parks go big for the holidays, from resorts to the parks, Christmas-time fills the Disney Resorts with endless activities. Ride's themed to the holidays and shows in the parks make it one of the best places to be for the holidays. From Epcot's International Festival of the Holidays to Mickey’s Very Merry Christmas Party, there's so much to do at Disney. Check out Disney World's and Disneyland's activities. Tivoli Garden's is where Walt Disney got many inspirations from for Disneyland, and their Christmas celebration is one of the most beautiful in the world. "Join us for Christmas in Tivoli, where this year you can enjoy a magical Christmas trip from the old station building in Wheelbury. In front of the station, the engine and carriages will be bursting with Christmas food, sweets, and gift ideas, while children can let off steam in Tivoli's Christmas ride, the Winged Wheel, or take a trip on the Elf Train. You can also enjoy a twilight tour of the Gardens, sparkling as always with thousands of beautiful Christmas lights and snowflakes glittering on the fir trees." -Tivoli. Tivoli is like nothing in the world, right in the middle of a bustling city, the small park takes you out of the city and puts you right into one of the most relaxing and beautiful theme parks in the world. Dollywood's Smoky Mountain Christmas is covered with lights strung as far as the eye can see, and has, of course, some of the best holiday shows any park in the world offers, from the "Parade of Many Colors" to "Christmas in the Smokies," Dollywood is unlike an other holiday celebration around. "Gather the family for the Parade of Many Colors! This returning spectacle is sure to become one of your favorite traditions. Catch it nightly on operating days!" Dollywood also brings a Christmas classic to life during the holiday season. "Based on the timeless holiday story of love and generosity, audiences will love this addition to our Christmas season." Six Flags Parks around the country are participating in Holiday in the Park, the seasonal celebration with thrill rides, sledding, dazzling lights, special seasonal entertainment, and more! The events run now through December at Six Flags Over Texas, Fiesta Texas, Discovery Kingdom, Mexico, Magic Mountain, Over Georgia, Great Adventure, St. Louis, America, and New England. Most attractions and shows are included with your 2018 season pass! Silver Dollar City's An Old Time Christmas featuring Christmas in Midtown. This year's display will be the biggest yet and is expected to see 400,000 visitors from now through December, approximately 1/5 of the expected 2.1 million attending the theme park this year. The park added over 1.5 million lights this year! Cedar Fair Parks Winterfest takes place with seasonal shows and thrills. "Live shows include a nightly tree lighting, carolers throughout the park, "It's Christmas, Snoopy!" ice show and more. Holiday crafters will design unique creations and guests will interact with the countless holiday characters, including Jack Frost, Candy Cane, and the Sugar Plum Fairy." -Cedar Fair. *Shows are different from park to park and subject to change. The Winterfest celebrations are taking place at Kings Island, California's Great America, Worlds of Fun, and Carowinds. The parks all have different hours from now through December 30, check the park's website for operating hours. Hyde Park's Winter Wonderland in London has the seasonal rides and ice skating right in the center of the city! It's a sight to be seen as Hyde Park is transformed into an amusement park filled with tasty treats and loads of rides! 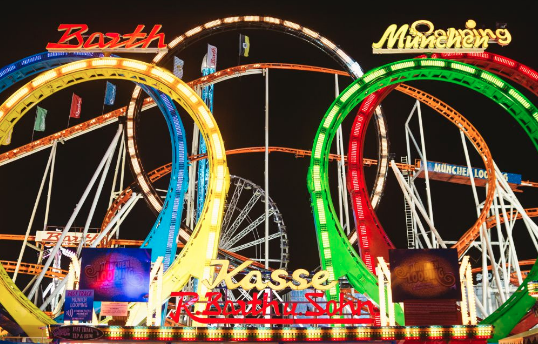 The infamous Munich Looping is back, the world’s largest transportable roller coaster. This famous ride from the popular Oktoberfest in Munich, made its UK debut at Winter Wonderland last year. Phantasialand Winter Dream is a celebration like no other! Or rent a private room for Fantastic Christmas, "Your guests will be left in awe before they have even stepped inside: Winding past an illuminated waterfall, they will reach a huge gateway under a majestic light dome, where the shimmering, secret underground world of Wuze Town will unfold before their eyes. Fantastical light effects blend with cutting-edge design to create a mysterious, enchanting atmosphere full of splendor and wonder – there is no venue more thrilling than this, the perfect spot for an extra-special celebration!" Either way, Phantasialand will make you enjoy the holidays like you never have before! 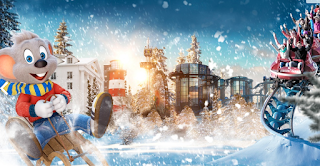 Europa-Park Magical Winter Season "Step inside an unforgettable winter wonderland, packed full of festive charm, magical moments, and seasonal surprises - experience Europa-Park at the most wonderful time of the year. Cobbled pathways twinkle with thousands of fairy lights and sparkling baubles, thick snowflakes float down upon 2,500 local Christmas trees between cozy log fires and magical 3D projections, and the festive aromas of mulled wine and freshly roasted almonds waft through the air. Whether you are looking for snow-covered adventure or just some cozy Christmas comforts, there is something for everyone to enjoy during Europa-Park’s winter season." The park is open through the 7th of January.